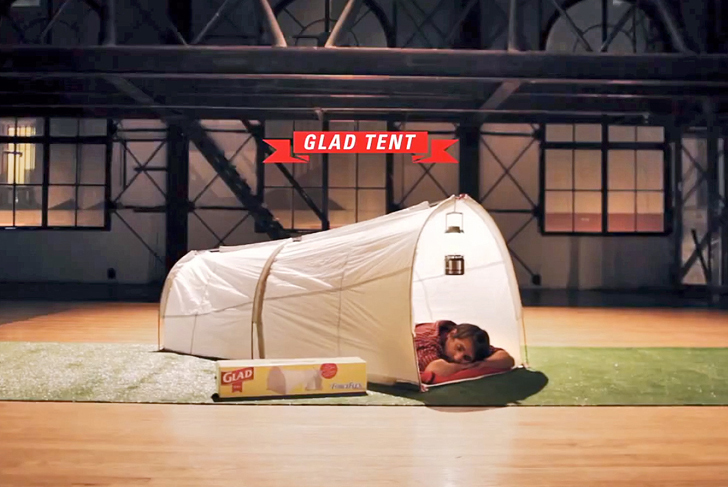 California-based company Glad may specialize in dustbin liners and food storage containers, but they recently unveiled a brilliant one-person trash bag tent for camping, music festivals and other outdoor events. The concept was launched at the SXSW 2013 music festival in Austin, Texas, where tents were distributed to campers and festival attendees on the condition that they would use them after the festival as garbage receptacles for cleaning up their campsite. Glad tents are conceived as a simple and efficient solution for the vast quantities of garbage left behind after big music festivals. Made from a stretchy and durable material, they are meant to be used as single-person camping tents during the performances and garbage bags for collecting post-festival waste. The tents, which promote an excuse-free approach to litter control, debuted at the South by Southwest (SXSW) festival in Texas and received a positive response, according to Glad. Glad has already tackled problems of waste control through their waste reduction and recycling initiatives but this seems to be the first time the company played with the reuse idea. With numerous music festivals lined up for the summer, it will be interesting to see how many Glad tents and other waste control initiatives are used to reduce the amount of waste left behind. These could be used for the homeless to give them a dry place to sleep. Great idea! How can I get some? Nothing but a poor marketing strategy to distract from the already wasteful plastic products that they produce. How bout a good old fashioned REUSABLE tent and enough recycling bins around so that people can recycle the majority of their waste rather than it heading straight to landfill! I'd love to see this type of thought energy directed toward those more in need such as our homeless. This is a sad solution to a terrible trait of many festival goers that bring copious amounts of booze, junk food, drugs and throwaway belongings that a garbage bag tent is an actual solution to their terrible wasteful lifestyle. I pick my festivals carefully now and seem to stay away from the idiots. Many people can attend a festival and leave zero waste by only bringing recyclables, leaving unnecessary consumables, and treating the environment and their bodies with respect. I strongly dislike this idea - all I see is one more disposable product, AND one that will make throwing away recyclables even easier and more acceptable! Much better to promote the other two "Rs," reducing and recycling! Sustainability FAIL! I'd be very happy to distribute these at the Festivals I go to. I am a stall holder and yes, these are perfect for the festivals.. would they last a week ?. Surely this just hinders the recycling process, as everything is chucked into one bag? At festivals such as Glastonbury people are given free or discounted tickets if they pick trash at the end. It works well as they can sort and separate recyclables as they pick. The trashbag tent idea is one that would be useful for our Buddhafield campsite in Mafoota District Jamaica. The owner and developer is seeking to create a spiritual retreat centre which my consultancy (British Expertise listing/Quantum Organiculture Institute, Jamaica, Research link)saw as offering possibilities for survival of an enclave of advanced thinkers in the event of a global apocalypse. The Owner lacks the 'real estate' to pursue his aspirations seriously but like the poor fisherman could be helped with the provision of a fishing rod and net.Would the company putting out these tensts consider donating a few as samples through the intermediary of the Quantum Organiculture Institute/My consultancy. I am now at retirement age and trying to keep active helping deserving groups pursuing sustainable development. The tents could be offered for accomodation of visitors interested in the site. Or what about a visit by Inhabitat personnel.A Jamaican location such as this would be a wonderful one to input in the development of, and showcase Inhabitat on a Terran global or planetary scale.